This is just the greatest thing to hit wedding photography in that last few years. 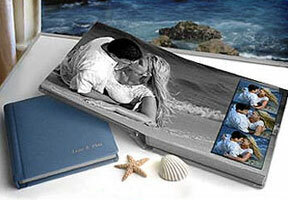 Photographers will actually bind your wedding photos into a coffee table book. No more lacey photo albums with your initials on it... These productions are modern and sleek. With many photographers approaching wedding photography with a photojournalistic technique, the end result is something that looks more like a LIFE magazine shoot than a family photo. Even Uncle Bob and Aunt Betty will look hip!